- Only 3 films has two scenes in the top 30 : HERCULES, HERCULES UNCHAINED and THE GIANTS OF THESSALY. Pietro Francisci has 7 scenes from his films: two from HERCULES; two from HERCULES UNCHAINED; one from HERCULES, SAMSON & ULYSSES; one from THE QUEEN OF SHEBA and one from SIEGE OF SYRACUSE. Three of those scenes are in the top ten. 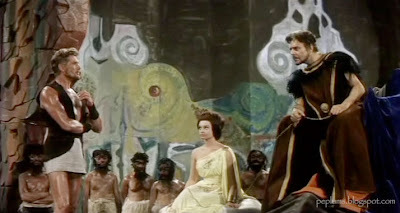 Riccardo Freda has 5 moments in the top 30: two from THE GIANTS OF THESSALY; one from SPARTACO : SINS OF ROME; one from THEODORA - SLAVE EMPRESS and one from MACISTE IN HELL. Three of those scenes are in the top ten. Giacomo Gentilomo has two scenes: from HERCULES AGAINST THE MOON MEN and GOLIATH & THE VAMPIRES. Steve Reeves has eight scenes in the top 30: one from GOLIATH & THE BARBARIANS; two from HERCULES; two from HERCULES UNCHAINED; one from LAST DAYS OF POMPEII; one from THE GIANT OF MARATHON and one from MORGAN THE PIRATE. Alan Steel also has four moments in the top 30: one from SAMSON; one from HERCULES AGAINST THE MOON MEN; one from THE GIANT OF MARATHON and one from HERCULES AGAINST ROME. Kirk Morris has 3 top scenes: one from MACISTE IN HELL, one from TRIUMPH OF MACISTE and one from HERCULES, SAMSON & ULYSSES. Gianna Maria Canale has two scenes, both of them in the top ten: one from SPARTACO - SINS OF ROME and THEODORA - SLAVE EMPRESS. And Sylva Koscina also has two with one from HERCULES and one from HERCULES UNCHAINED. Many of my favorite films like SAPPHO THE VENUS OF LESBOS, APHRODITE - GODDESS OF LOVE, THE LAST OF THE VIKINGS, KINDAR THE INVULNERABLE, HERCULES AGAINST THE MONGOLS, THE BACCHANTES didn't make it in the top 30 even though there are many amazing moments in these films but not strong enough to stand alone.